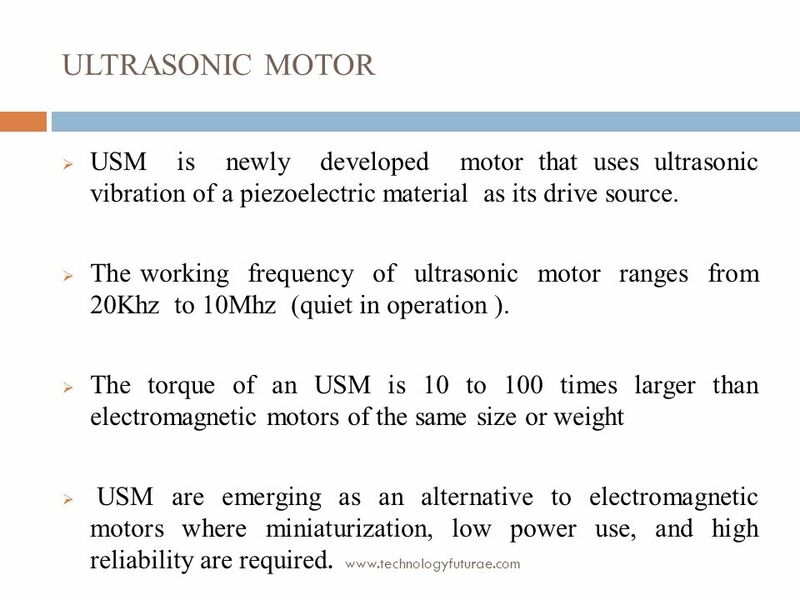 4 Ultrasonic motor USM is newly developed motor that uses ultrasonic vibration of a piezoelectric material as its drive source. 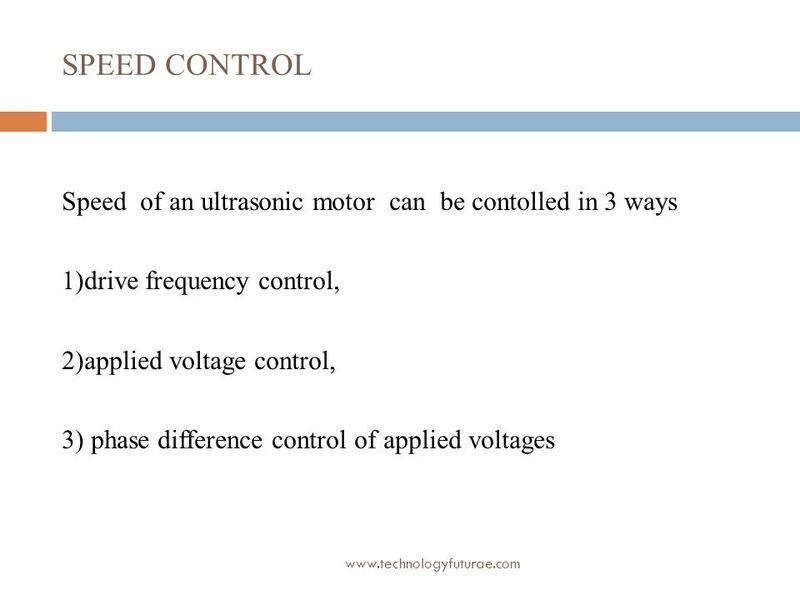 The working frequency of ultrasonic motor ranges from 20Khz to 10Mhz (quiet in operation ). 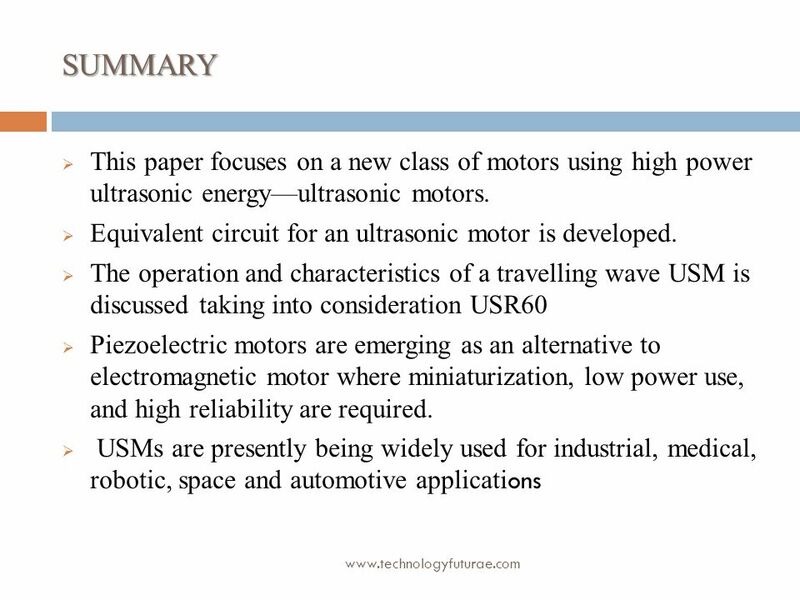 The torque of an USM is 10 to 100 times larger than electromagnetic motors of the same size or weight USM are emerging as an alternative to electromagnetic motors where miniaturization, low power use, and high reliability are required. 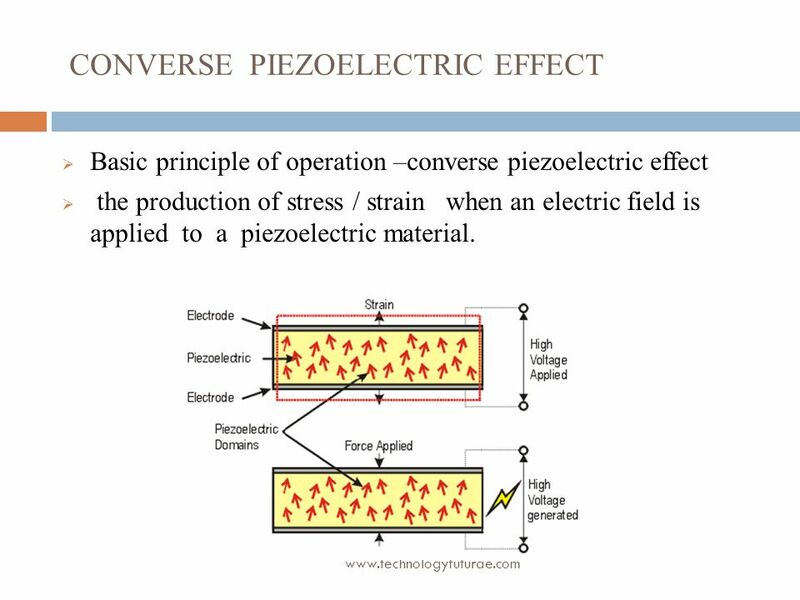 Basic principle of operation –converse piezoelectric effect the production of stress / strain when an electric field is applied to a piezoelectric material. 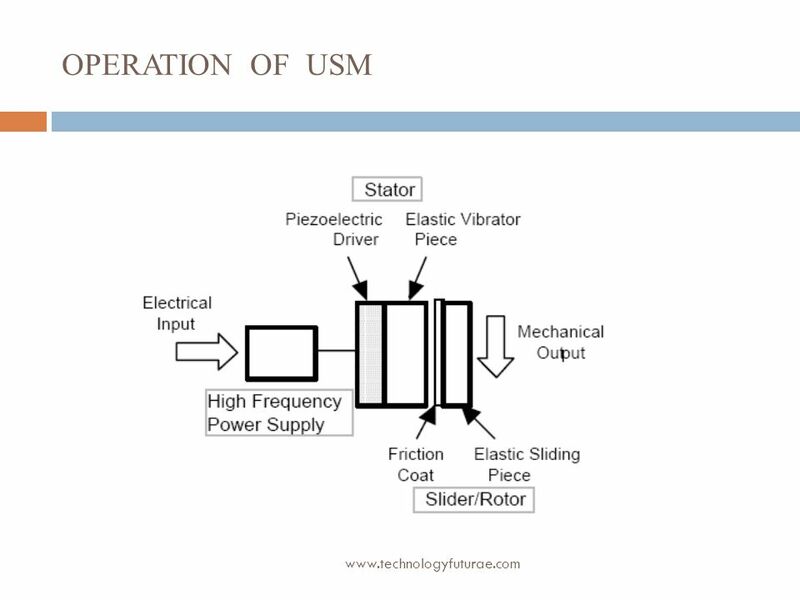 9 In the operation of the USMs two-stage energy conversion is formed. 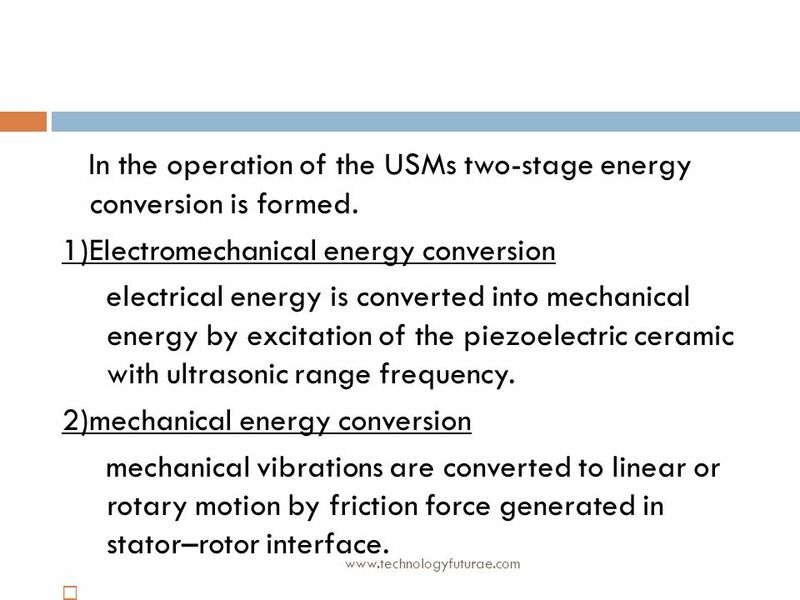 1)Electromechanical energy conversion electrical energy is converted into mechanical energy by excitation of the piezoelectric ceramic with ultrasonic range frequency. 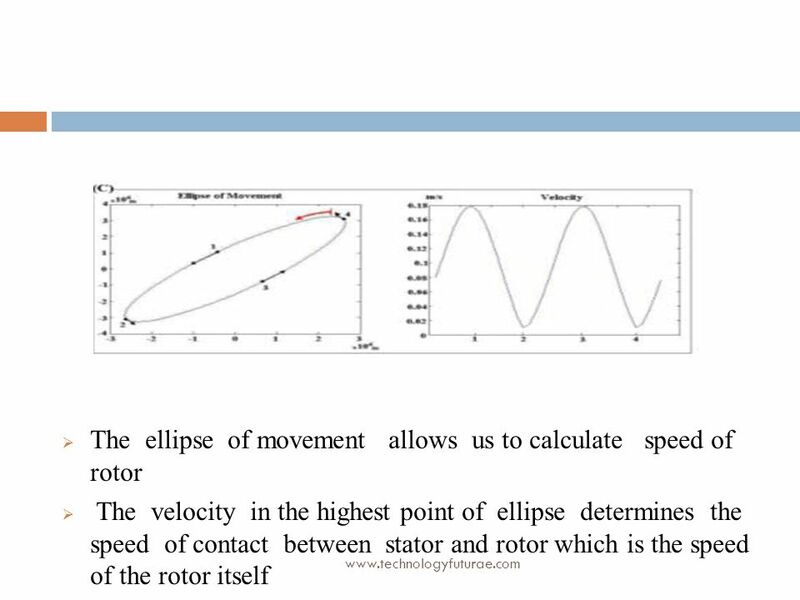 2)mechanical energy conversion mechanical vibrations are converted to linear or rotary motion by friction force generated in stator–rotor interface. 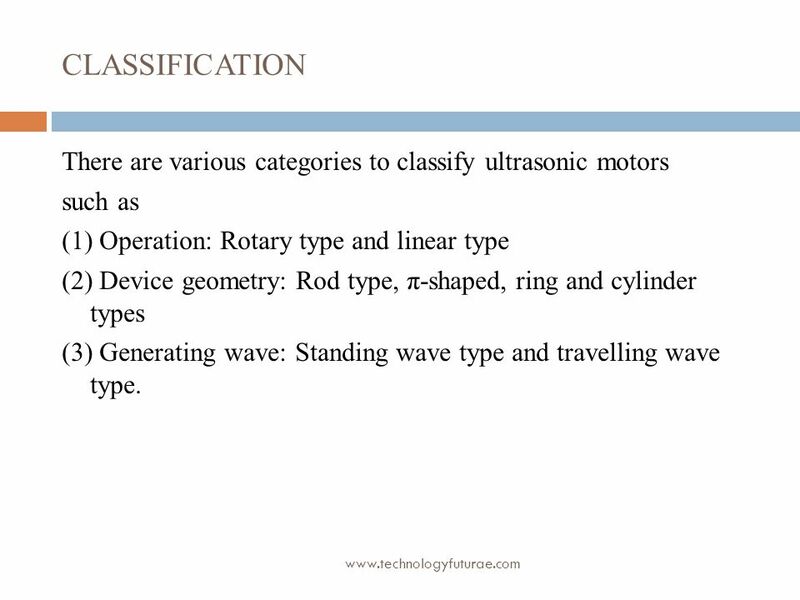 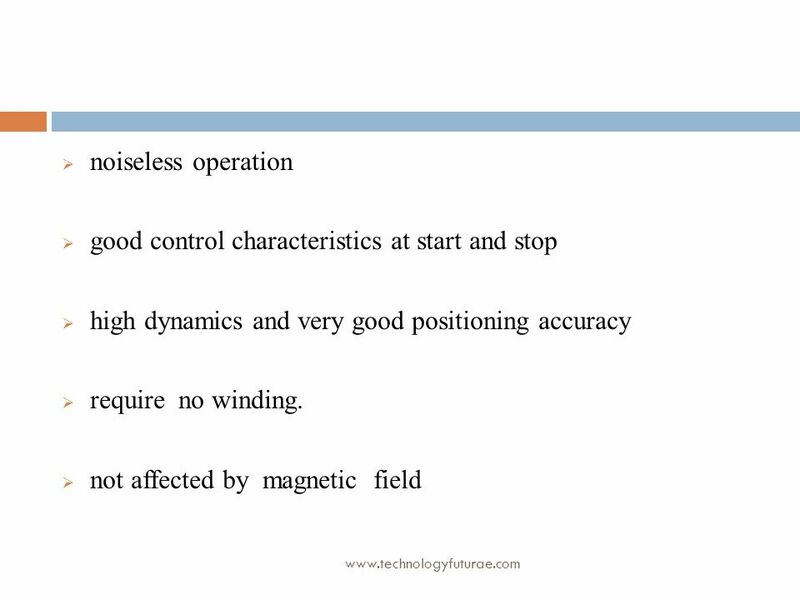 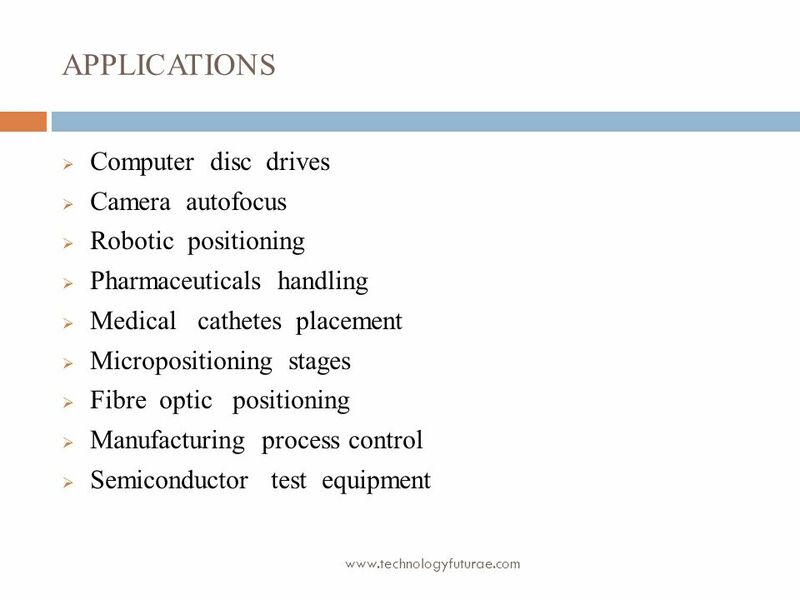 10 CLASSIFICATION There are various categories to classify ultrasonic motors such as (1) Operation: Rotary type and linear type (2) Device geometry: Rod type, π-shaped, ring and cylinder types (3) Generating wave: Standing wave type and travelling wave type. 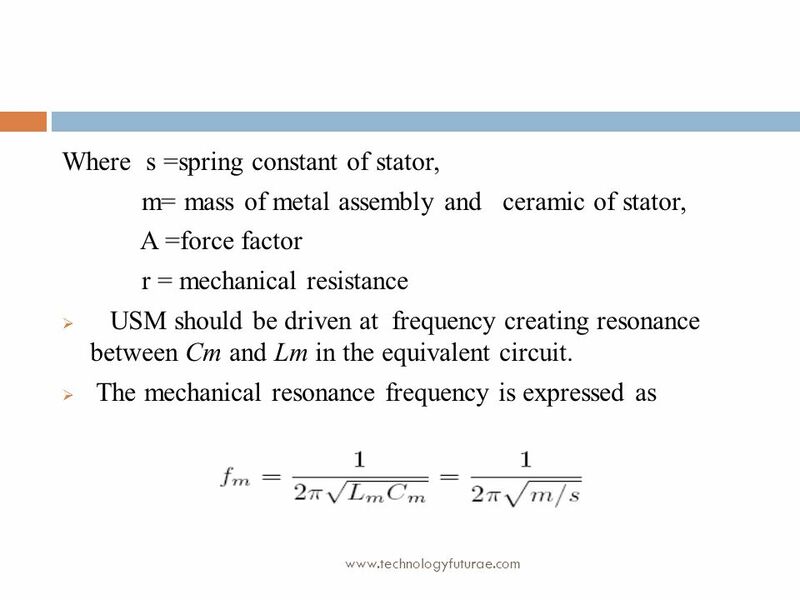 15 To generate a travelling-wave within the stator, it is necessary to have control of 2 mechanical orthogonal modes. 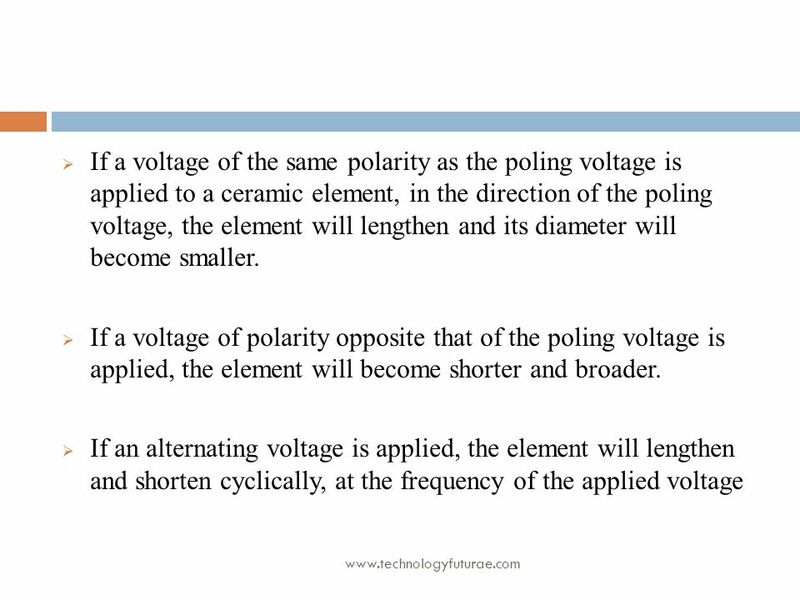 Electrode pattern A provides cos(kθ)and pattern B provides sin(kθ). 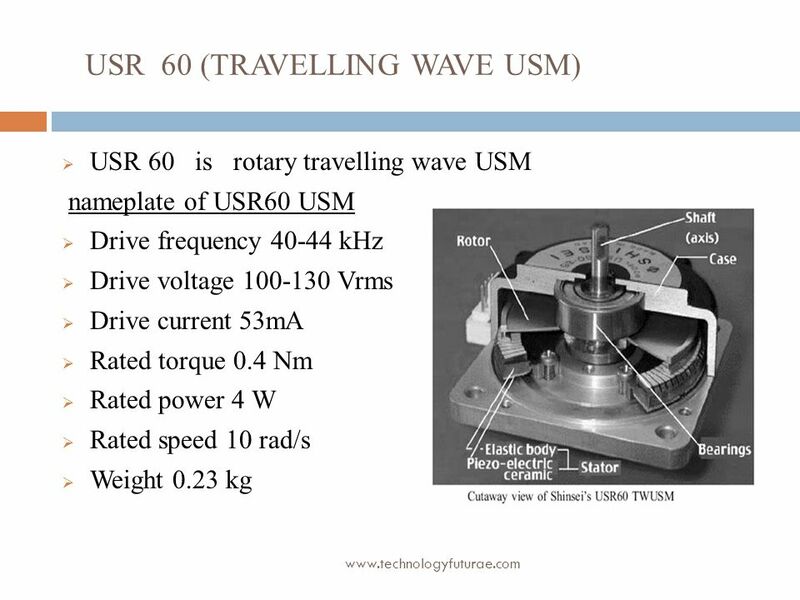 By driving these 2 modes 90 degree out of phase temporally a travelling-wave is produced. 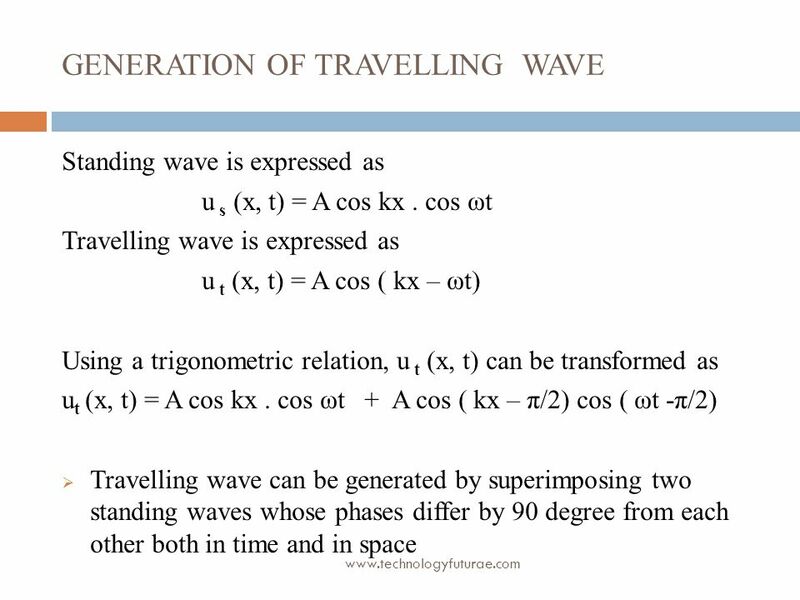 Patterns A and B provide a standing wave individually. 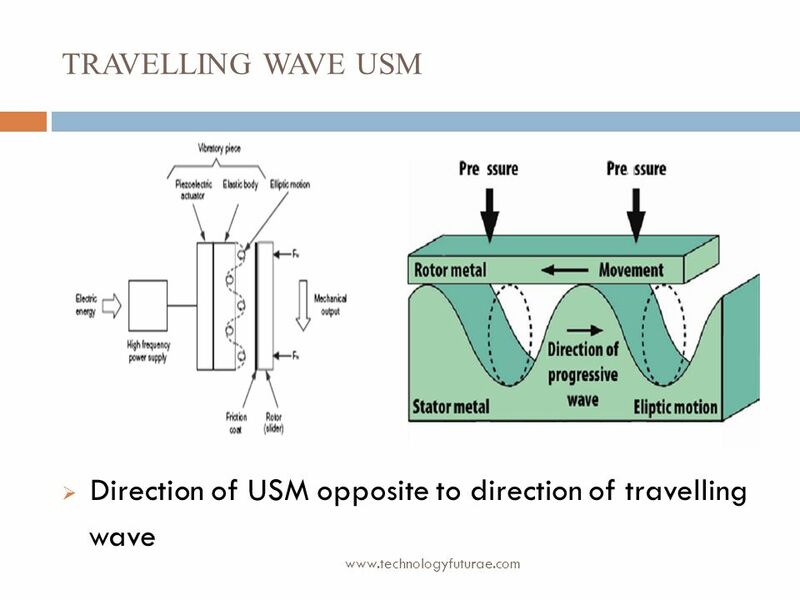 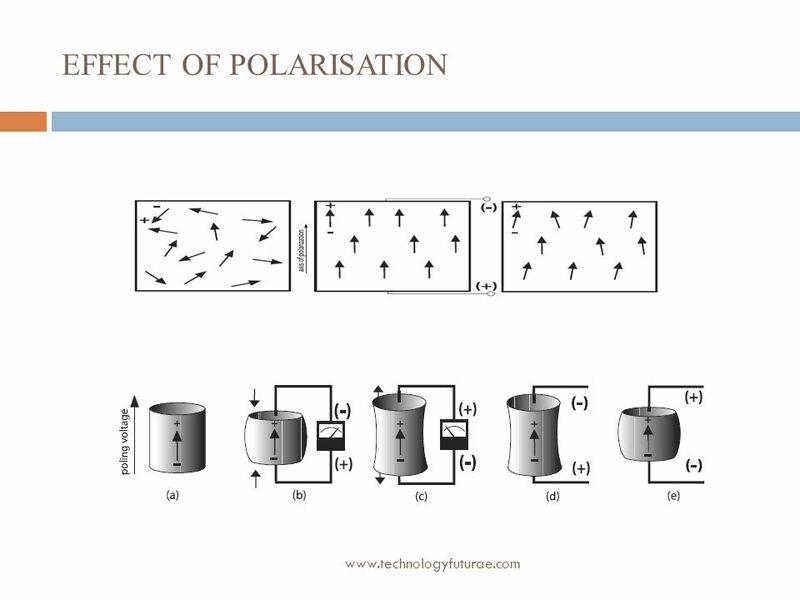 The superposition of standing waves produces a travelling-wave By changing the sign of one of the drives signals the direction of the travelling-wave and the direction of the rotor changes. 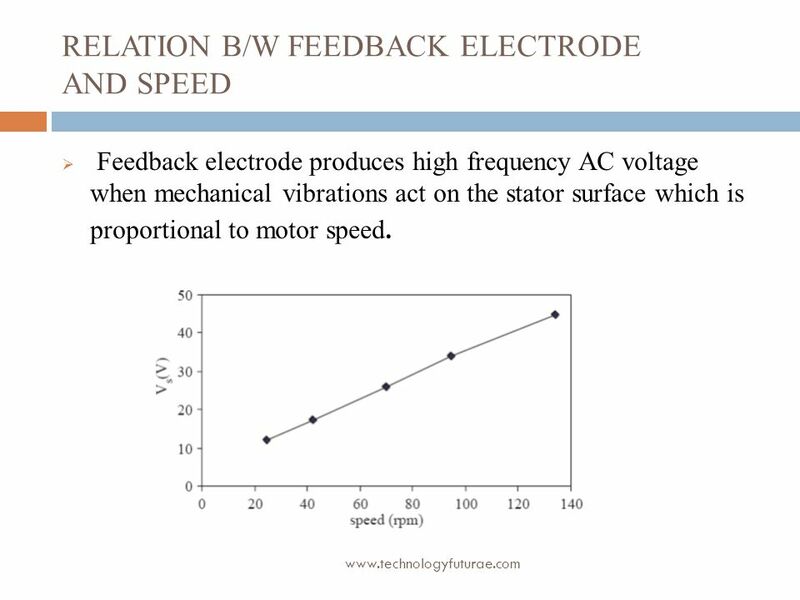 Feedback electrode produces high frequency AC voltage when mechanical vibrations act on the stator surface which is proportional to motor speed. 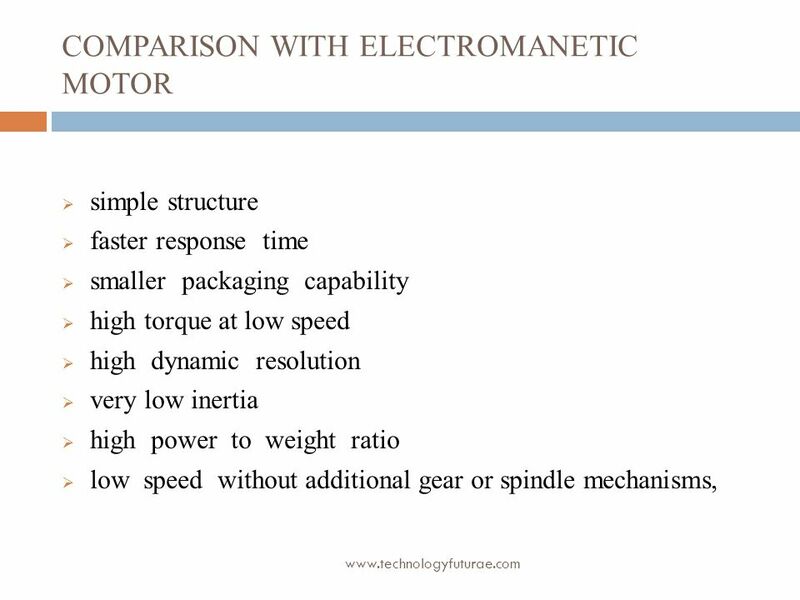 Three methods have proposed to estimate motor characteristics. 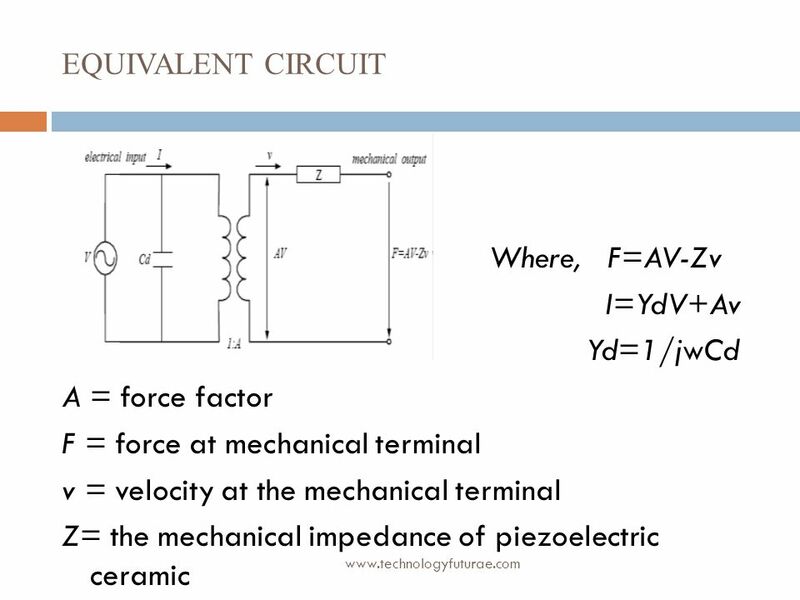 1)Finite element method-----( where no electrical parameters are considered). 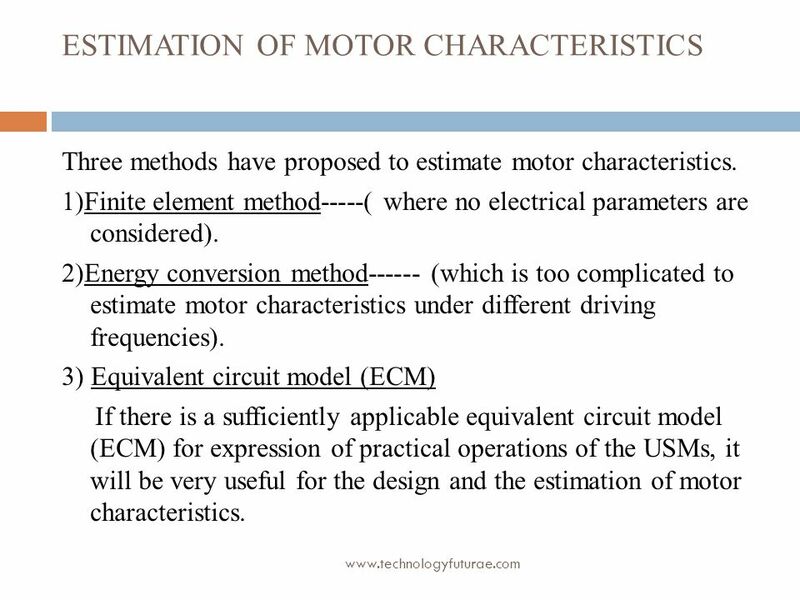 2)Energy conversion method (which is too complicated to estimate motor characteristics under different driving frequencies). 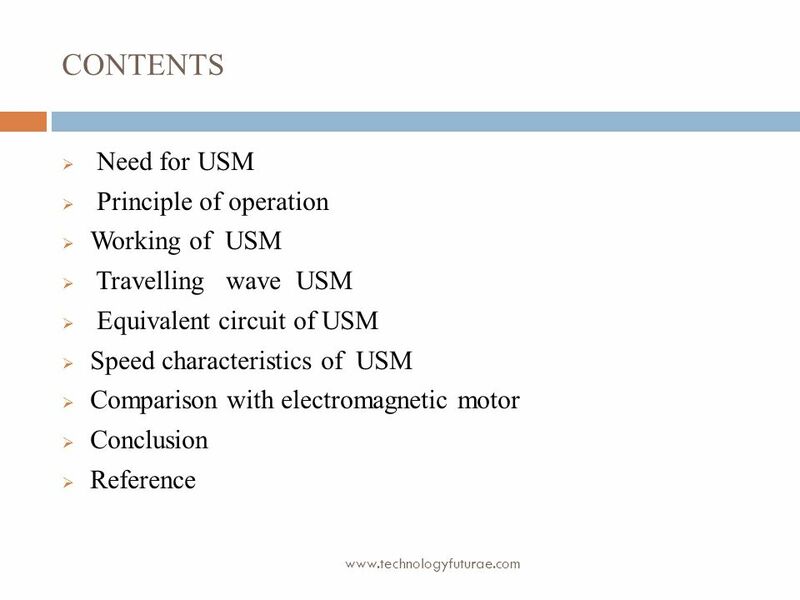 3) Equivalent circuit model (ECM) If there is a sufficiently applicable equivalent circuit model (ECM) for expression of practical operations of the USMs, it will be very useful for the design and the estimation of motor characteristics. 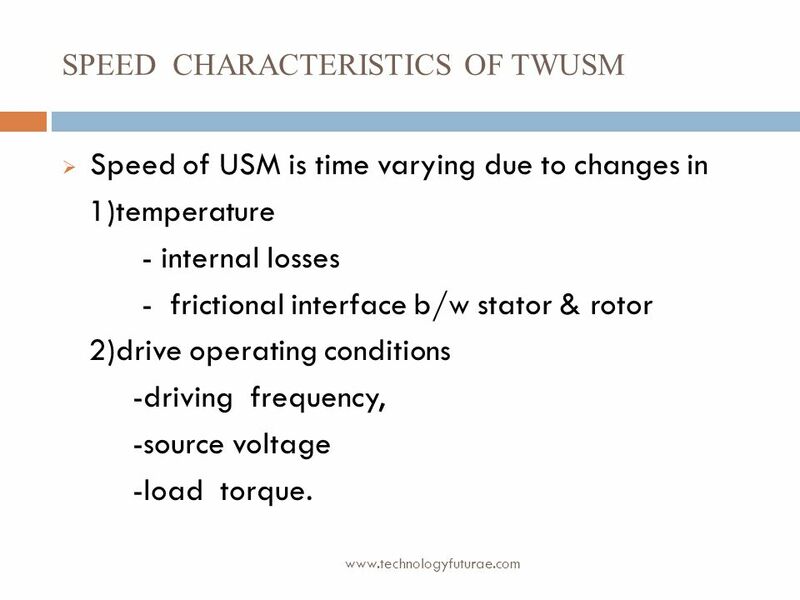 Speed of USM is time varying due to changes in 1)temperature - internal losses - frictional interface b/w stator & rotor 2)drive operating conditions -driving frequency, -source voltage -load torque. 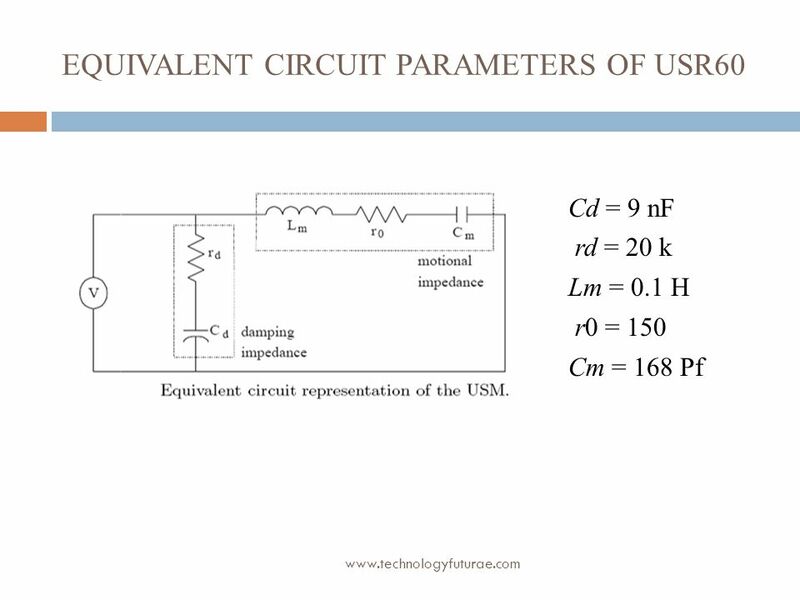 30 Necessity for a high frequency power supply. 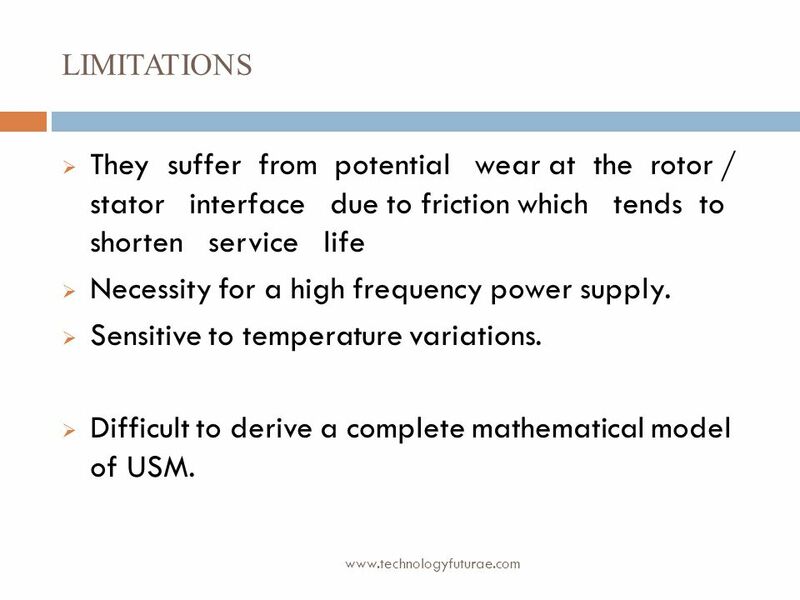 limitations They suffer from potential wear at the rotor / stator interface due to friction which tends to shorten service life Necessity for a high frequency power supply. 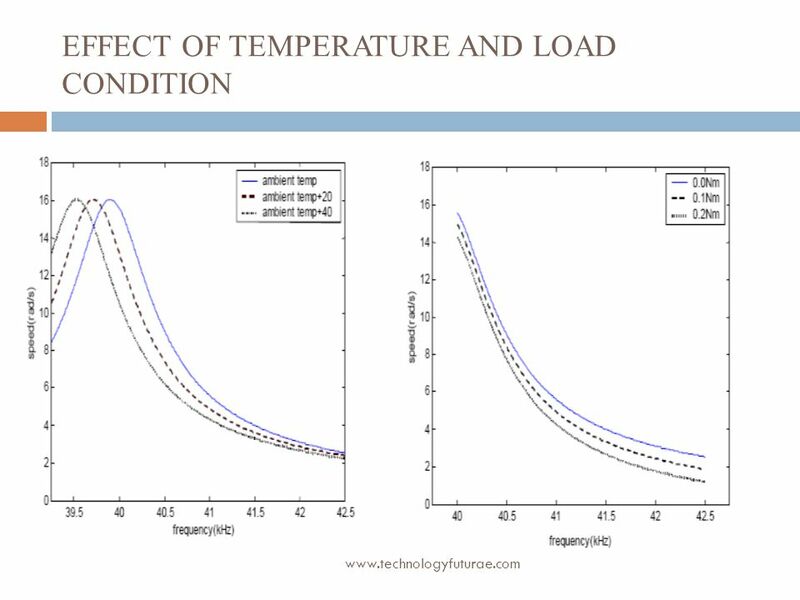 Sensitive to temperature variations. 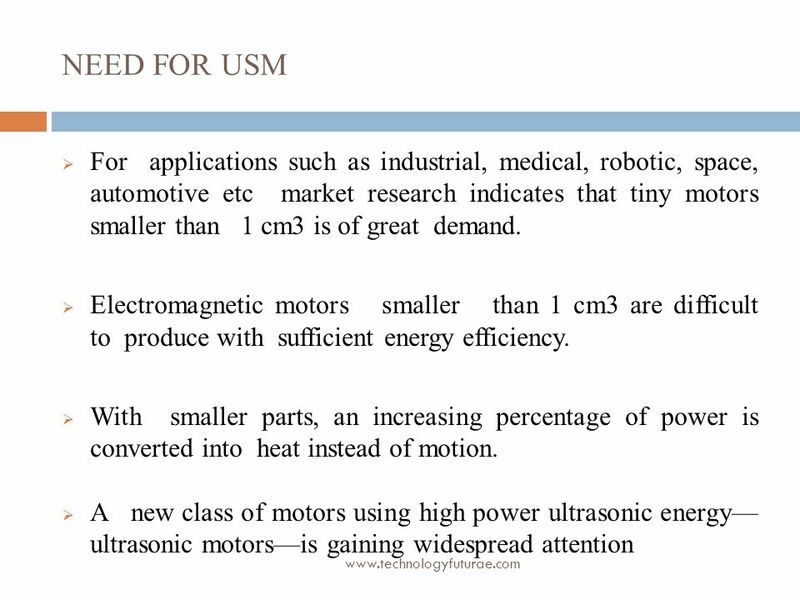 Difficult to derive a complete mathematical model of USM. 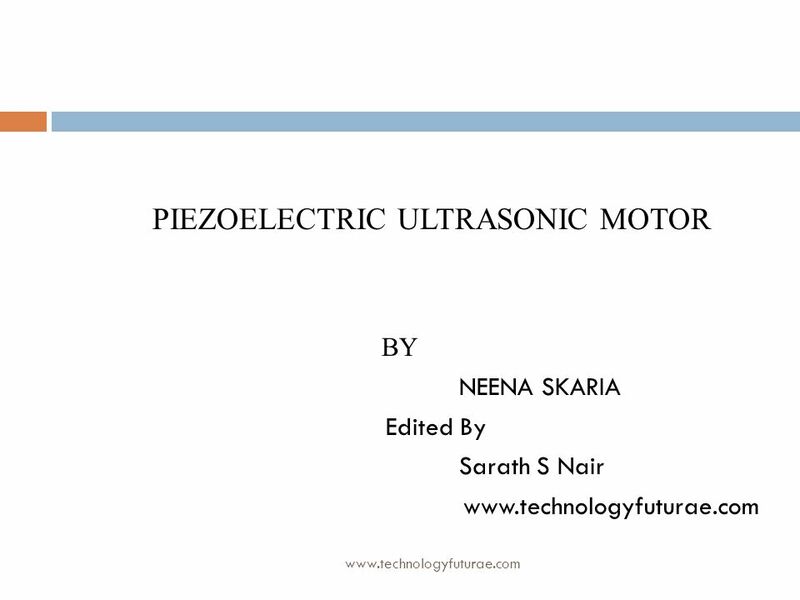 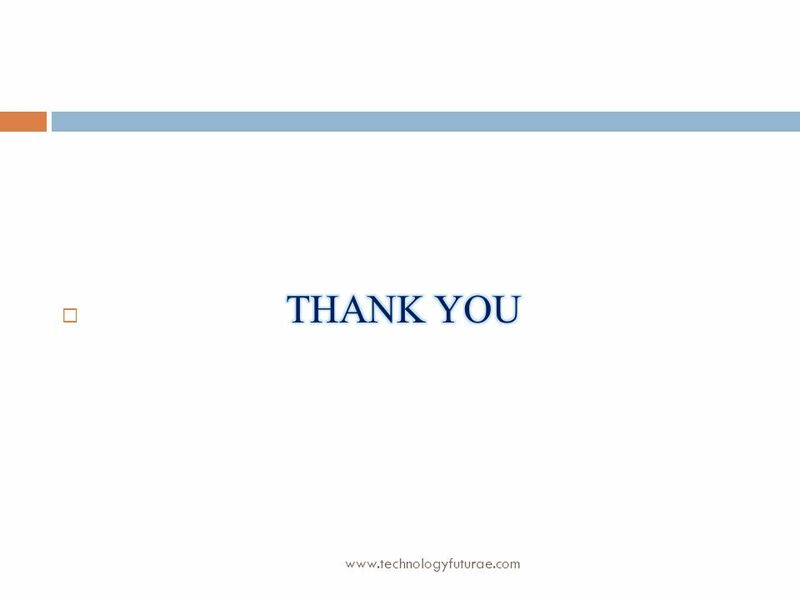 Download ppt "PIEZOELECTRIC ULTRASONIC MOTOR"
M ULTIPLE R EFERENCE F RAME A NALYSIS OF A M ULTISTACK V ARIABLE - R ELUCTANCE S TEP PER M OTOR By Prabu.T Edited By Sarath S.
Modelling and Analysis of Single-Phase Induction Motor with External Rotor Uma. 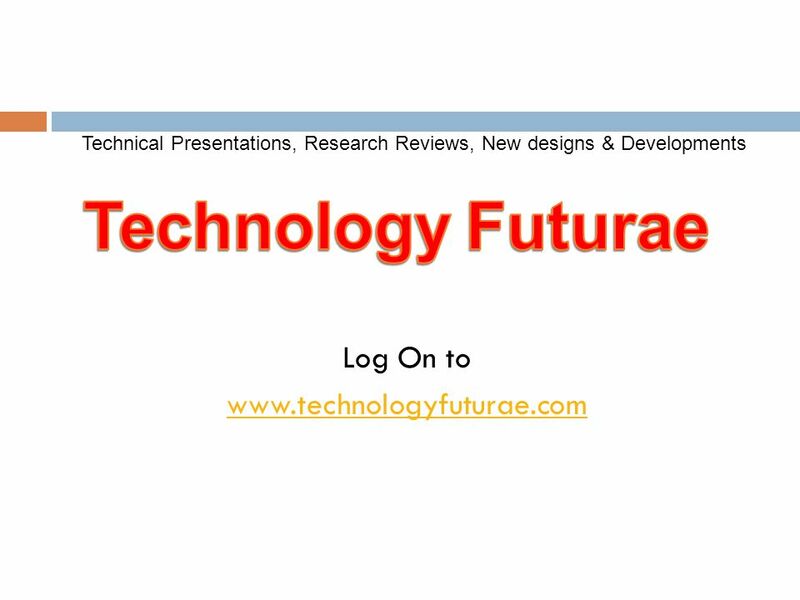 R Edited By Sarath S Nair 1. 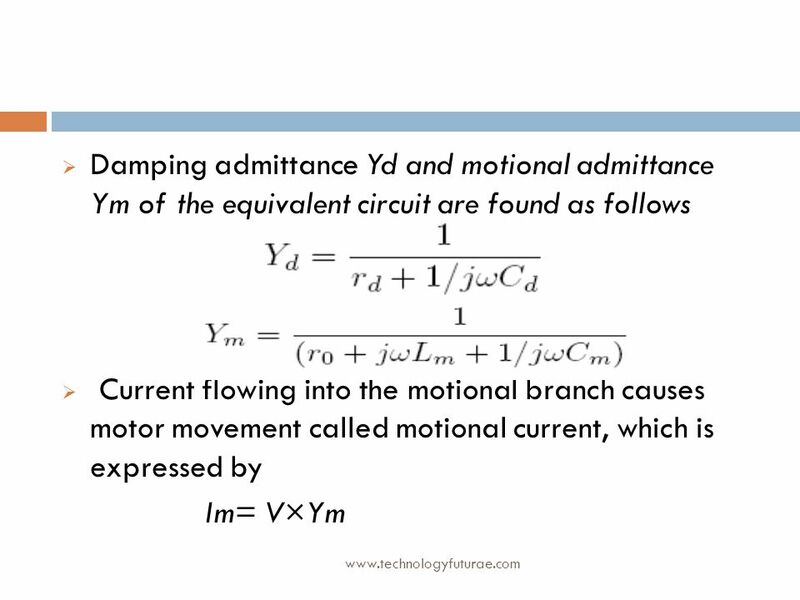 Chapter 13 AC Motors. 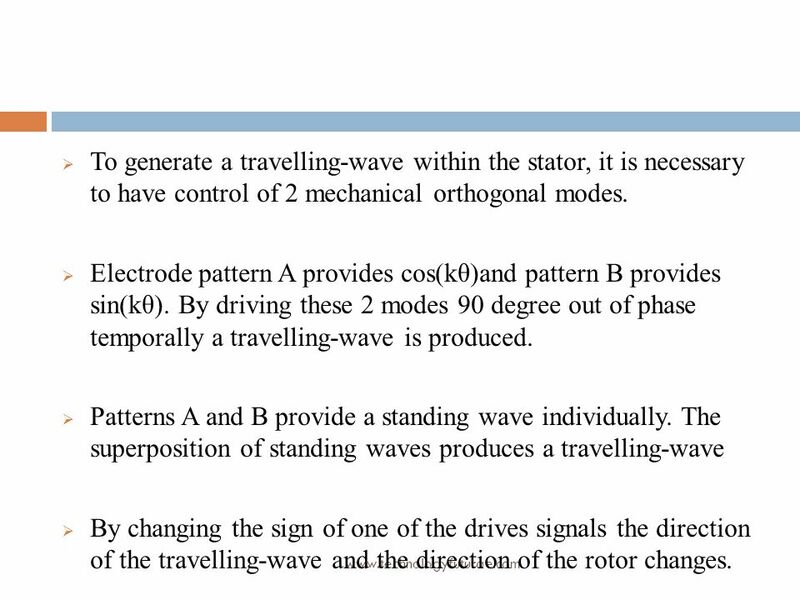 Chapter 13 AC Motors Objectives Discuss the operation of an induction motor. 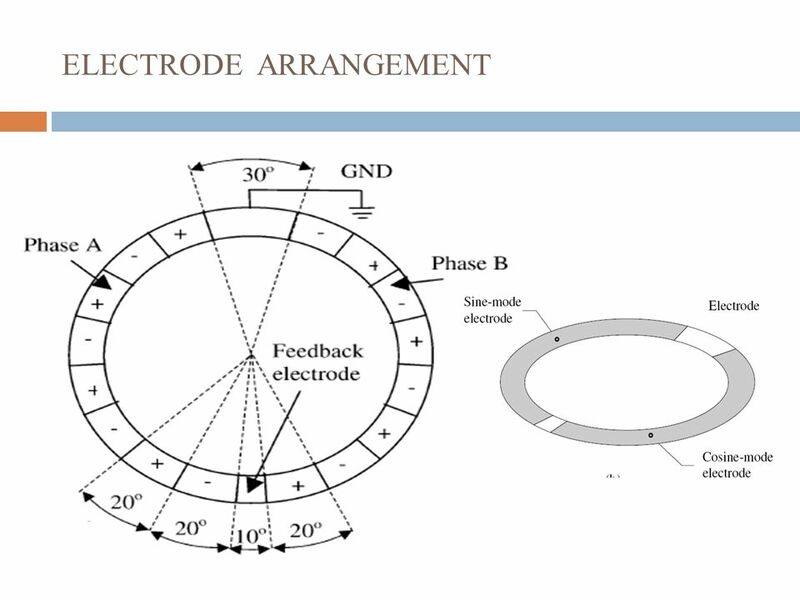 Identify and explain the operation of various three-phase. 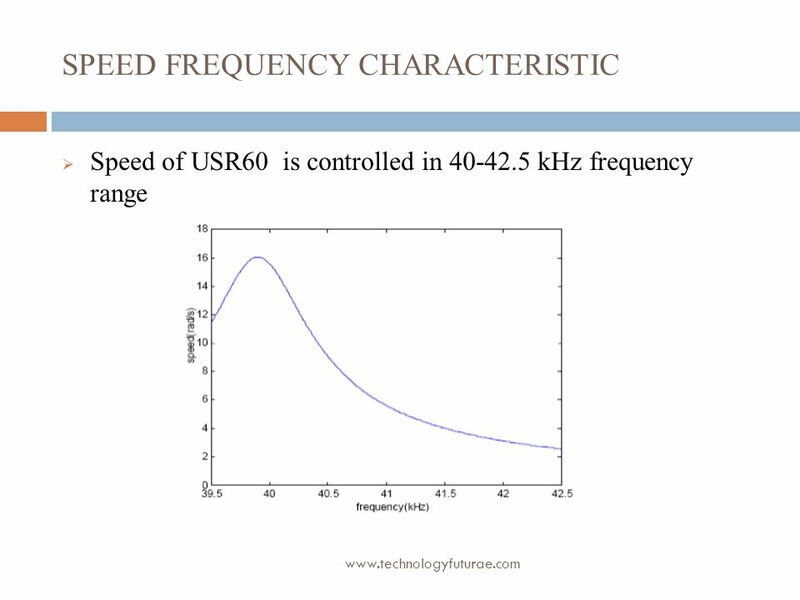 50Hz N S Load All Actions A1  A weight is balanced at equilibrium position of a spring and produce a Simple Harmonic Motion with acceleration Which. 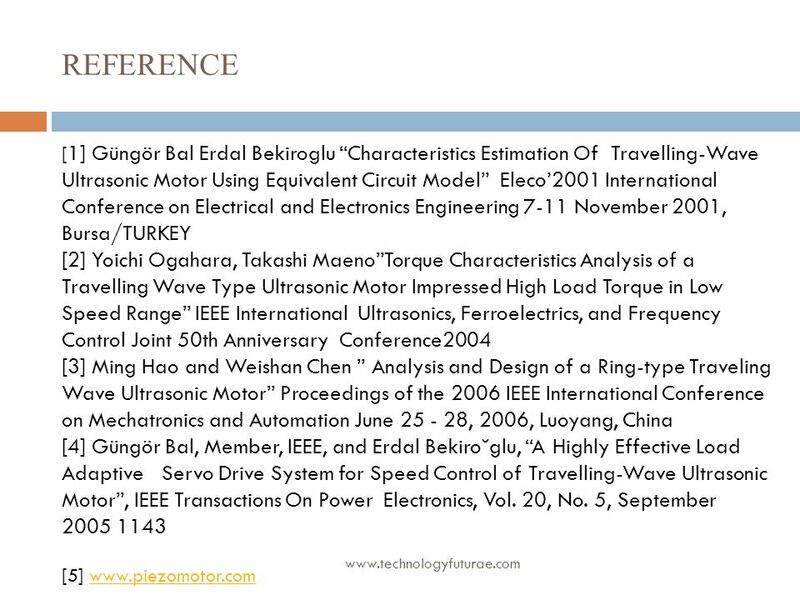 T. YOSHIDA, J. OYAMA, T. HIGUCHI, T. ABE and T. HIRAYAMA Department of Electrical and Electronic Engineering, Nagasaki University, Japan ON THE CHARACTERISTICS. 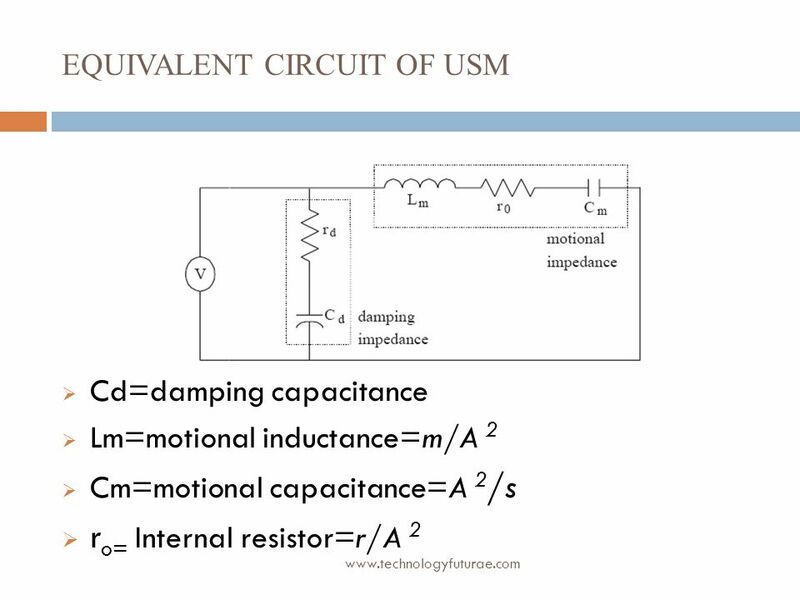 Variable Capacitance Transducers The Capacitance of a two plate capacitor is given by A – Overlapping Area x – Gap width k – Dielectric constant Permitivity.